9am: I have a late breakfast of toasted malt granary bread with peanut butter and a cup of tea, coming in at under 11p, as surprisingly I am not too hungry this morning! I am feeling a little under the weather, there is definitely a cold or flu lurking, but I feel that this has been coming for the last month. I have lots to do this morning but feel full enough to tackle it all. Green Omelette (packed with spinach and sprinkled with paprika), under 42p. 4pm: FLAPJACK TIME! I can’t contain my excitement, they look nice, smell nice, I even had the patience to let them cool a bit on the wire rack. Anyway, I sit down and sigh in anticipation, I take the first bite. You know, it is actually quite nice. It is never going to be like the usual, as this has no sugar/honey/maple in it at all, so it is far from saccharine, but there is a pleasant, subtle sweetness from the banana and a nuttiness from the peanut butter. I am happy, this will do, especially as my tastebuds can't quite remember what sugar is like anyway! In retrospect, I would have waited until the banana was a little more ripe (and sweeter), but I was too impatient. I made 4 generous-sized flapjacks from 4 ingredients for under 24p. Not bad. This will definitely be relied upon for energy dips in my days. Banana and Peanut Butter Flapjacks. Yum. And just 24p for 4 generous squares. 7.45pm: Still full on flapjacks, I prepare Hubble’s tuna steak and noodles, and start to puree my tomato and peppers for the base of my soup. I finally add a little full-fat milk and chopped sausage. The soup tastes wonderful and actually doesn’t need the sausages at all, but I thought I would pop them in for protein’s sake. 47p/portion. 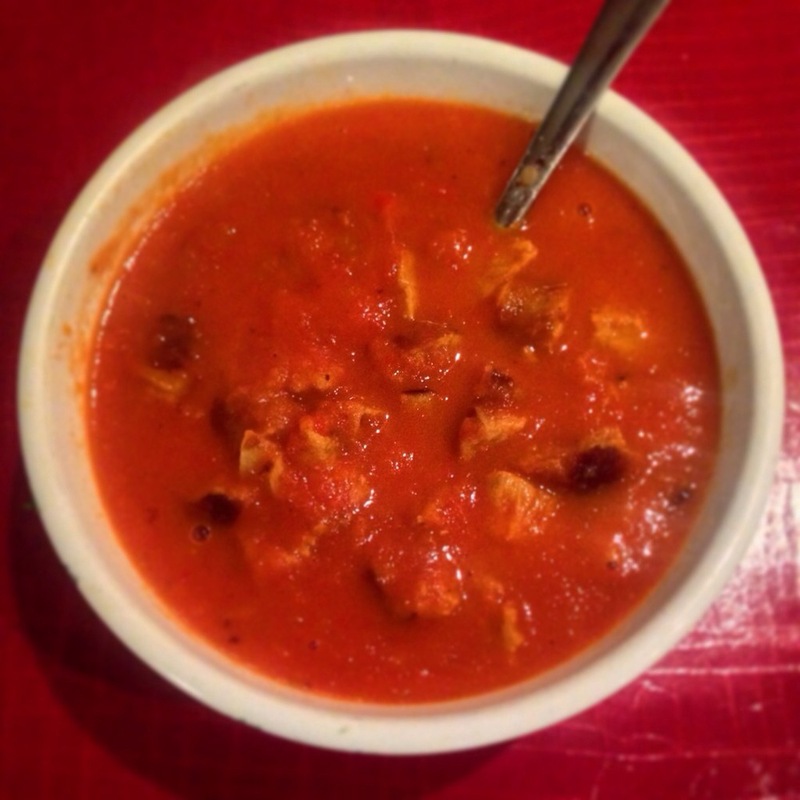 Warming bowl of creamy tomato and pepper soup with cooked sausage stirred through. About 47p. 10.30pm: I go to bed happy.